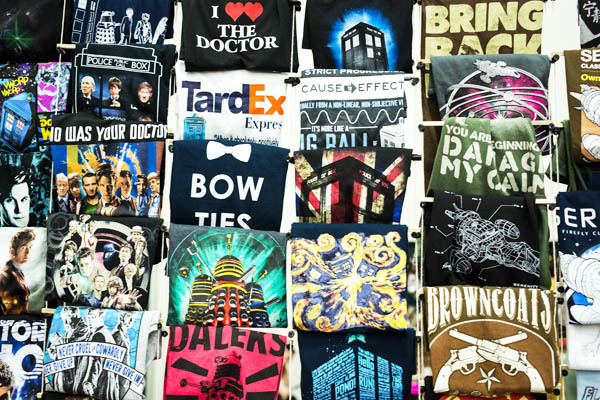 It’s not just about the costumes and cosplayers; at any and all comic-cons regardless of who is the host, you will find loads of vendors hawking their wares. Comics, novels, paintings and drawings, toys, costumes, swords and knives, autographed memorabilia…the list goes on. Some artists are already famous and some are working their way to it. One such case of an up and coming artist is this young man, Joseph Bayer, of SpiderStopShop. His work just blew me away! Of course there were also the ubiquitous tee shirts with just about anyone or anything on them. Can you guess what bit of Sy-Fy I’m drawn to here? And I did purchase one of these. 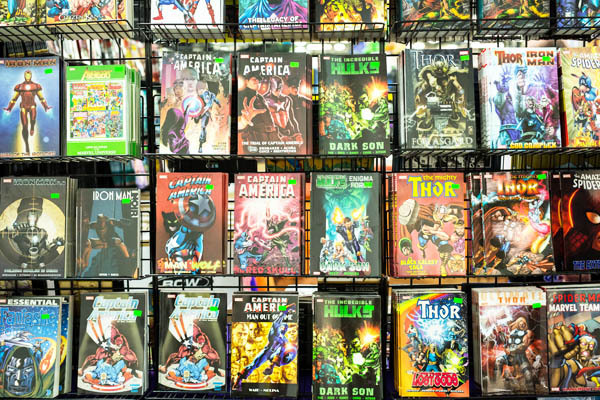 The books range from really REALLY expensive collectors editions comics (we’re talking hundreds to thousands of dollars) to more affordable selections (you will find me at the 3/$1 bin). 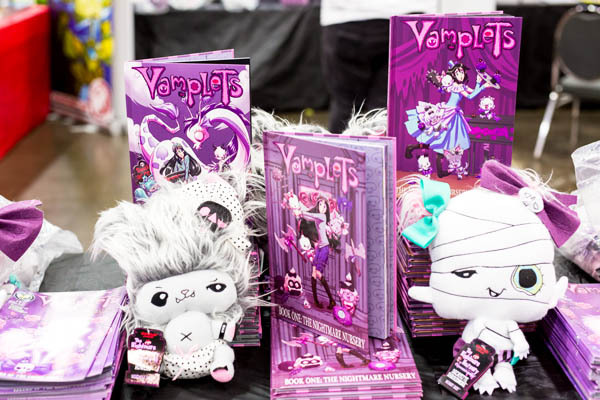 These Vamplet books are just ideal for the little girl with slightly different tastes or adult – I’m not judging 😉 The story line is about a human young lady who somehow ends up working at a monster nursery. The two dolls shown here are Howliss, a wee werewolfling, and Decayette Shroudmore, a mummy baby. Even baby monsters are adorable…and really soft and cuddly! There’s definitely something for everyone to enjoy at comic cons. 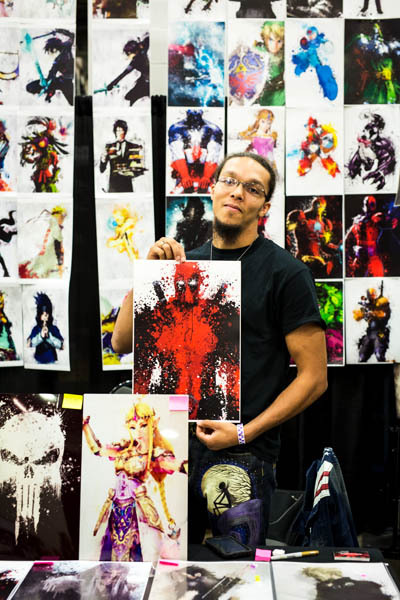 This entry was posted in Art, event, Ohio, photography and tagged art, artists, books, Canon, Columbus Ohio, Comic Con, comics, photography, photos, Sigma, toys, tshirts, vendors, wizardworld. Bookmark the permalink. Nope! Although I do have a Dalek here on my desk 🙂 I got a Dr. Who shirt. Well in my case I didn’t discover Dr. Who until I was a young adult and stumbled on it one late night. It was Tom Baker – I was hooked! This always looks like a fun events and I admire how you really get into it and then shares it with others – great posts! Thanks! I go flat out for these events and love them. My goal is to attend one of the BIG cons one day. I’ve never been, but it does look like such a fun event…so many interesting things to see!